Cheapjeep just had the awful experience of having his golf car catch fire- man that thing is 'uckin fugly. In that thread, a 400 amp fuse is brought up. 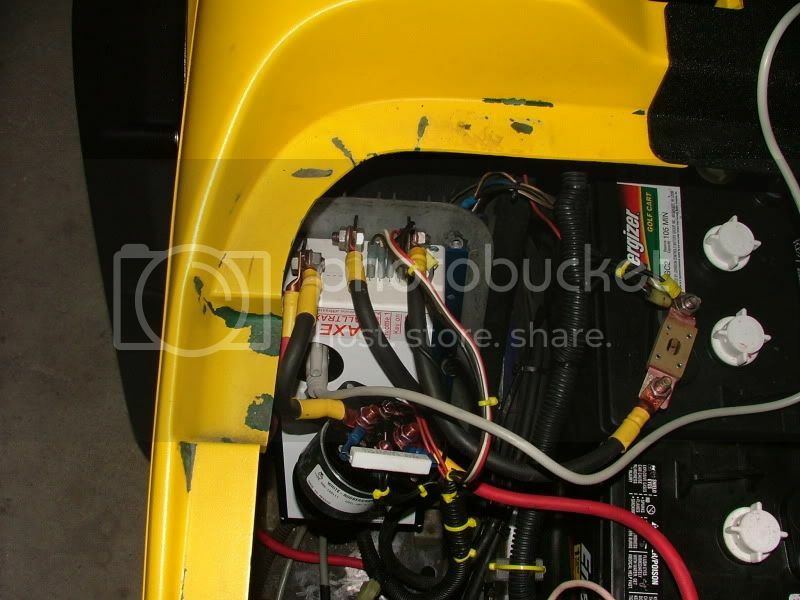 So where in the battery string would be the proper place to install a 400 amp fuse? The negative post of the sting, the positive post of the string, going into the controler, or? Here is an installation page from ALLTRAX. as close to the power source (batteries) as possible. + or - does not matter. Correct! Alltrax often shows the fuse on the actual controller but I do not like this.... I want it right at the pack to stop a short at the source of the power. Plus if the fuse is at the pack, it's easy to check and replace versus being tucked up under the cart. Do you install it like the link above? Can you show a pic of an install? Has anyone ever seen one of these fuses burnt or blown? Did the cart that burned up blow the fuse? Yes, it blew the fuse? Didn't stop the fire from happening though did it? The reason I was asking is because I have seen controller failures, & motors fail and blow the controller, & I have seen batteries blown up .... but i have never seen one of those fuses blown.